The Sermon on the Mount and the Lord's Prayer are at the heart of the New Testament and the key to the message and life of Jesus. 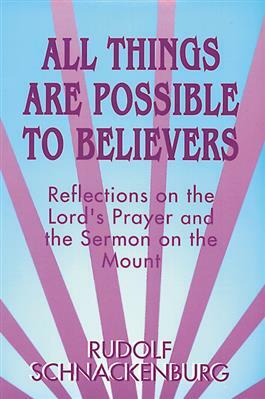 In this book, Rudolf Schnackenburg provides a clearly written and easy-to-understand exegesis of the Sermon on the Mount in light of the Lord's Prayer. By doing so, he demonstrates that the strenuous requirements for true discipleship as prescribed in the Sermon on the Mount are indeed attainable especially when read in the contest of Jesus' whole message.